Lighting-Gallery-net - Fluorescent - T-12 and larger/Sylvania F40CW/1160MM just shy of 4' where are they used? 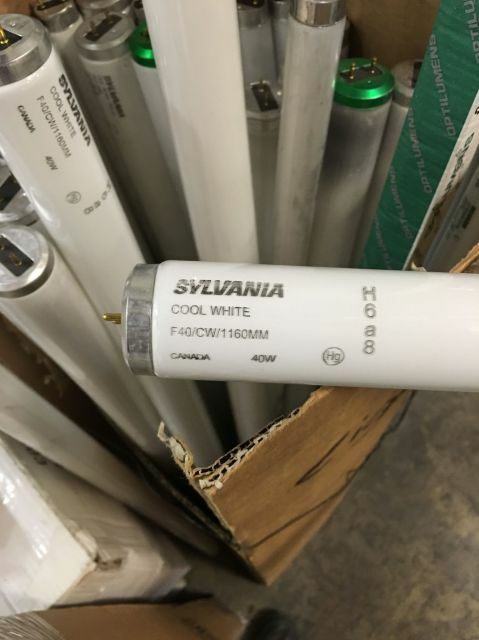 Sylvania F40CW/1160MM just shy of 4' where are they used? They are as long as a F48T12 slimline or RDC lamp, about 45 inches or so. Looked on google and cant seem to find any info! Are they slightly longer or shorter than 4foot? Pretty neat. I too have trouble getting comments on posts. Cant understand if its people just not enjoying the content or the site not being effective enough showing updates. They are slightly shorter, about the same length as a F48T12 slimline. As for comments it depends on the frequency of visitors and who visits here at a given time. I've never heard of such a lamp. Any turret I've came across used standard length F40's. Hmm yeah my turret and Western Electric lights with plunger sockets use normal lamps. Perhaps these are "conversion lamps" to convert from T12HO to standard output T12? I suspect that might have been a practice in the 70s and 80s when electricity rates skyrocketed, but cool lamp either way. It's 2.331 inches shy of 48". Quite hard to find! Interesting thought on RDC caps ... Length-wize, that should work out just about right! F40 Metric just saw some on Craigslist the other day. The ones I saw were made by philips and the post was from Canada. Not sure if these are common there or not but I have not seen one in person and I am not too far from Canada.